This booklet, originally from our UK partners, will help you get the most out of your training with the PoolMateHR. 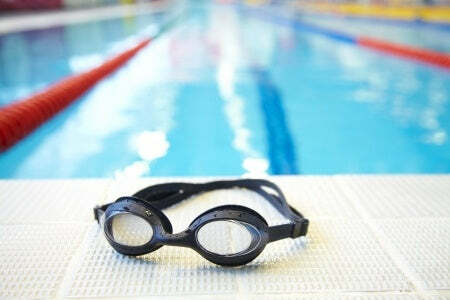 Learn how swimming heart rate differs from dry land activity, and then complete some of the swim sessions and drills to improve your fitness and swimming by renowned swim coaches that are packed into the guide. Best of all, it’s free! Read on see a sample chapter on aerobic capacity testing with the PoolMate HR, or download the entire guide complete with workouts below. If you are a regular swimmer, you probably either have a set session or training schedule to follow, but how do you know differentiate between technical improvements and fitness improvements? For the fitness aspect, heart rate can be an excellent way to track aerobic fitness levels. A solid training program should bring decreases of 10-20 beats per minute over several weeks of training (Maglischo, Swimming fastest), but a personal coach is not in the cards for everyone to create such a regime. With the Poolmate HR heart rate belt and watch, you can test your aerobic capacity at monthly intervals with the technique below. To maximize consistency, make sure each test is completed on the same day of the week, at the same time, in the same pool, with similar preparations such as diet and sleep etc. after an easy day/ day off of training so you are rested. Swim as near as possible to the same level of effort and same stroke type, and take the same amount of time for rest. 4. Each 200m should be at a fairly intense but manageable speed. Try to swim each set at that pace. 5. After the last 200m, rest for 1 minute- this is important as we need to see your recovery heart rate too. 6. Cool down for a good 5 minutes or longer until your heart rate is at normal levels. 7. Upload your data to the PoolMatePro software, select the sets data tab in the top right of the screen and you will see your time for the set, it you scroll along to the right you will see your average heart rate for that set. Even though the active heart rate remains unchanged, the combination of a shorter average time and decreased recovery heart can indicate an increased aerobic fitness. In the second session it takes 3 seconds less per 200m on average, another indicator that aerobic fitness has likely increased. Heart rate values can change from day to day naturally, so it’s best if you can repeat the test over several sessions to get a good picture of the underlying trend. The recovery heart rate is thought to be a better indicator of fitness than working heart rate and a lower number means you are recovering quicker so are getting fitter. Beware, if your recovery heart rate is higher than the month before this can mean you are overtraining, failing to adapt or coming down with an illness. So take a look at how much training you are doing and how you feel, cut it back if necessary to give your body time to recover. Let us know what techniques you use with your PoolMate HR in the comments below, or tweet @swimovateUSA!